Samsung just recently introduced its all new Galaxy Tab 7.7 in Indian market.In India the tablet is named as Samsung Galaxy Tab 680. 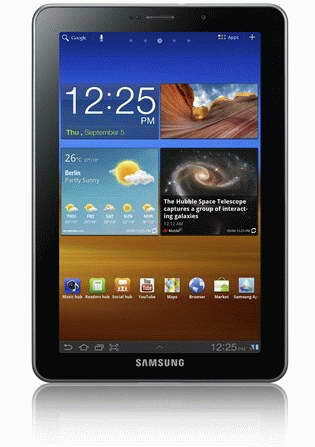 The new Samsung Galaxy Tab 680 tablet is the thinnest Android tablet by Samsung with a thickness of just 7.9mm.Samsung Galaxy Tab 680 is already available via Flipkart for a price tag of Rs.33,571. The all new Samsung Galaxy Tab 680 tablet equips a 7.7-inch Super AMOLED Plus touchscreen display with 1280 x 800 pixel resolution and is powered with 1.4GHz dual-core processor along with 1GB of RAM and an Internal memory 16GB. Other Fetures includes a 3.2MP rear-facing camera, 2 megapixel front-facing camera, Bluetooth 3.0, dual-band Wi-Fi, HSDPA, and a 5,100 mAh battery.The tablet comes with Android 3.2 Honeycomb OS but can be updated to Android 4.0 Ice Cream Sandwich OS.Galaxy Tab 680 tablet has a weight of 340 grams and its dimensions are 196.7 x 133 x 7.89 mm. Tags:- 7-inch tablet by Samsung, Android 3.2 tablet, Bluetooth 3.0 tablet, Galaxy Tab 680, Galaxy Tab 7.7, Honeycomb, Samsung Galaxy Tab India price, Samsung new tablet in India, Samsung Galaxy Tab 680, Samsung Galaxy Tab 7.7, tablet in India price, thinnest tablet in India, Samsung Galaxy Tab 680 tablet india price, Samsung Galaxy Tab 680 tablet features, Samsung Galaxy Tab 680 tablet specs, Samsung Galaxy Tab 680 tablet details, price of Samsung Galaxy Tab 680 tablet.